Many of you must have heard of Temsutula (Atula) Imsong, the Naga lady who was applauded by Prime Minister Mr. Narendra Modi himself because of her dedicated effort to clean the Ghats in Vanarasi. Imsong is the Vice President at a voluntary social organization called 'Sakaar'. 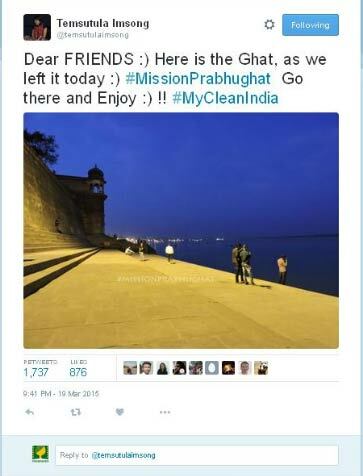 She has been part of a campaign called 'Mission Prabhughat' which seeks to clean the ghats in Varanasi and inspire people to keep their surroundings clean. Vibei: When Narendra Modi tweeted about your work how did you feel? Atula: (Laughs……). The day he tweeted about the team, it was on 31st March. When my friend called up on 1st April to tell me about it, I thought it was an April Fool prank but she insisted that it was no prank. There was no harm in checking so when I opened my Twitter, I was speechless. I couldn’t believe my eyes that the Prime Minister tweeted about our work and the excitement and happiness was just inexpressible. By that time, we were getting appreciation from people like Amitabh Bachchan, Sachin Tendulkar and many famous personalities but to get praised by Mr. Modi was just extraordinary. That motivated me and my team more than ever. He was in Canada at that time and he even mentioned us in his speech. Vibei: You are an inspiration to many people after your Varanasi project, what made you take up this project? Atula: I was in Delhi for around 7 years, then in 2012, I came to Varanasi and yes, there are lots of difference between Delhi and Varanasi. When I first came here, my first thought was to start a cleanliness drive. We started with small things and never thought we will take up a project of this kind. One fine day, we were strolling around and reached Varanasi ghat. We were saddened to see that the condition was worse than ever. It was like an open toilet. That’s when we started our mission. Vibei: We have seen and heard a lot about you but many people still want to know more about you personally, tell us a little more about yourself. Temsu: I am from Ungma village, Mokokchung, Nagaland . I have a large family. Among 7 siblings, I am the fourth one; I have 5 sisters and 2 brothers. My father is a retired government school teacher and my mom is a housewife. I did my schooling in my village itself and graduated from St. Mary’s College (Shillong), then came to Delhi and started working. Most of my work was in the educational sector. Vibei: What made u think about becoming a social worker? Atula: As you know, living in places like Nagaland, we are exposed to social communities, social work in schools, churches and student bodies since our childhood. I will say, the environment that I lived in has encouraged me to become a social worker. I had always wanted to do more of social community work and do something for my society. Even when I was working in Delhi, after my working hours, I used my free time to work for those in need of my help. Vibei: Born and brought up in Nagaland, you can see that there are also some places out there, like “the Ghat in Varanasi “that are polluted, what would you to suggest the people to do? Atula: Yes, yes, there are lots of places. And yes, when I started my Varanasi project, lots of people encouraged and motivated me to carry on and many people called me to come and work in Nagaland. Once, when my friend called me, I told her, anyone can work better than me, all you have to do is open your mind and once you start something, people will start following you. And in Nagaland, it is very easy to mobilize this kind of drive because, we are used to this kind of community work and we like to help each other, you should not have the excuse of government not supporting. If one really wants to do something, one will have to start it. There are lots of people who want to work for the society, so be a leader and start it, people will follow you. Vibei: Share with us, some of your challenges you faced during this project? What kept you moving? Atula: Well, there was no any such big issue that we had to delay or stop our work but of course, in the beginning, we were only 5, there was no one to help us, and we had to stand there and ask people to help us, people who came for an evening walk, people who strolled around that area and they did co-operate. And in all our missions - Prabughat, Chet Singh Ghat, Babua Ghat and more - we did face financial problems, but thanks to some good friends who were kind enough to help and we were able to complete our missions. Vibei: What is your next project? Atula: We have a lot of work in mind but unfortunately because of this Monsoon season, it’s all pending as everything is submerged in the water. If the weather permits us we will start our new mission on Sunday , i.e 23 August, we will start with our mission “Parijat” by cleaning ponds which have been turned into garbage, it will be all over India, even in Delhi, and this time we will specially work on water bodies (you are welcome to join, haha). If one sees any place that needs reviving, one can tell us and we will look into it. Vibei : The river flows from Ganga. 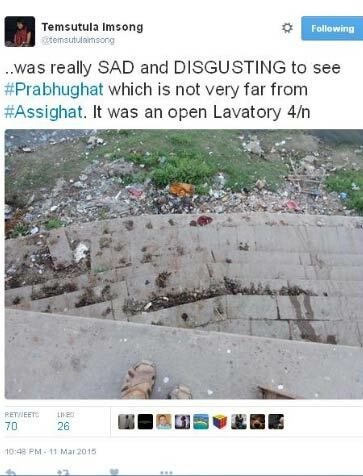 You being a Christian, there had been a lot of comments about you cleaning the Hindu’s sacred river, what will you like to comment on that? Atula: Cleanliness is not about my religion. I did see those comments but I want people to know that everyone wants their place and surroundings clean and it’s the same for me too. No matter where I am, even if I am in Nagaland, Varanasi or Delhi, I will love rivers and nature and I feel its ones duty to keep their surrounding clean. And I know Ganga is a religious place but if we put aside Hinduism, Ganga is the source for many livelihoods. Muslims, Christians and all kinds of people come for fishing and their other purposes. So, let people say what they want to, I want to be positive, I am happy that I am doing something for my society. Vibei: What else would you like us to know about your organization? Atula: We basically work with rural people, help people around and are basically a self-help group. We give education to underprivileged students. We adopted a small school and work there too, we help the villages and we are ready to help anyone who needs us. We are also helping a group of people in my village in Mokokchung. There, we are helping the ladies weave our traditional shawls and clothing. Very soon, we are going open a project with the help of the government i.e NDLM (National Digital Literacy Machine). It is a big project launched by the central government, the first centre will be starting from my village. Vibei: Do you think Indian government is actually making enough effort and giving support in order to actually give quality environment for the people? Atula: Well, I feel the government is trying its best to improve the health of the environment. Taking a look at how the Ganga is being cleaned making it a “National Mission” where there is a group formed to clean it. The government is also making an effort but people should also help by following the rules because in the end, it all depends on the public. It will take time but things will get better. Vibei: Any words you would like to share with the readers? Atula: When I started this mission, I did not do it because I wanted media attention or to get praised. But things changed and a lot of people came to know about our organization. We happily accepted because we want people to be aware and know what one can do for the society and live in a healthy environment. When we started we had nothing, but we had determination and it did end up pretty well. I encourage everyone to start something too, I would like to remind you that “if you don’t start what you are thinking, you will never achieve it”. Don’t be taken aback because of personal problems; anyone can stand for the society. And thanks to Facebook, Twitter and all kinds of social media, we can promote our work and thoughts for the betterment of the society. Many people are willing to help, and they will gladly come forward if you start something good for the society. Have determination and be positive!